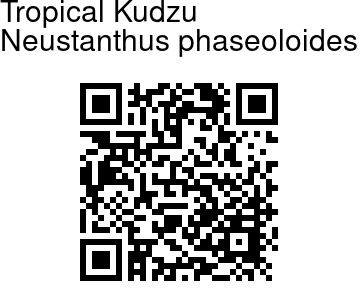 Tropical Kudzu is a climbing, perennial shrub, with slender, rusty-hairy stems growing to 2-10 m long. Leaves are trifoliate with distinctive leaflets which are rhombic in shape, 3-15 cm long. Leaflet margin sometimes have undulations. Leaf stalk is 3-11 cm long. Flowers arise in raceme-like clusters, 15-30 cm long. Flower stalks are 2-5 mm long. Sepal tube is 3-4 mm long, velvety, with the upper 2 teeth joined almost to tip. Petals are lavender, with white margins. Standard petals is broadly elliptic, about 1.8 cm long, eared at base. Wings are eared and lobed at base. Keel is sickle shaped, acute. Fruit is linear, 5-10 cm long, velvety, dark grey. 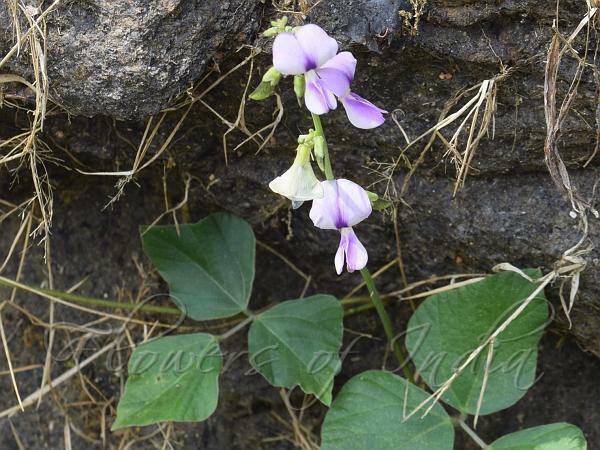 Tropical Kudzu is found in the Himalayas, from Nepal to Sikkim, Assam and SE Asia, at altitudes of 1000-1300 m.